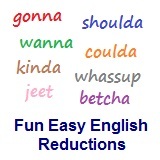 ﻿ Fun Easy English - new-american-english-reductions-reduced-words-topic-word-you-would-you-woujya. In this lesson you will learn the American English reduction woujya. Woujya like to go to the movies tonight? Woujya be happy if you could be president of the United States of America? Woujya buy this if it were on sale? Woujya ever think about coloring your hair green? Woujya like to be my girlfriend? Woujya is an American English reduction often used among friends in America especially when asking to do something together. Reductions, such as woujya are not real words in English.